The changes are subtle but effective. A couple of days ago of its refreshed 2019 Renegade, promising a more complete unveiling today. Well, here it is. 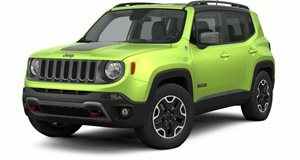 Presenting the 2019 Jeep Renegade, a whole two images worth. Front and rear shots, along with the previous teaser, are the only images Jeep has released so far of the facelifted subcompact crossover. It’s having its official debut in Turin, Italy, at the Turin Auto Show. Yes, this is the European-spec version but we doubt its US counterpart will look any different. So, what’s new? The cosmetic changes seem to be limited to new headlight and front bumper designs. It’s more of an enhanced look than anything else. Out back, the taillights, as we already saw, have also undergone a slight update with the elimination of the black ring surround. The familiar “X” design remains, although it’s now red instead of white. The blue 2019 Renegade you’re looking at is the top Limited trim, so less equipped versions may look slightly different. The outgoing Renegade, pictured here in white, still looks relatively fresh considering it launched for 2015, hence the very moderate facelift. Jeep has yet to release images of the updated interior. Under the hood, at least in Europe, will be a new 1.0-liter three-cylinder with 120 hp, or a 1.3-liter four-cylinder developing either 150 hp or 180 hp. Based on output alone, the US will likely have the latter engine and output. An on sale date and official pricing have yet to be announced.